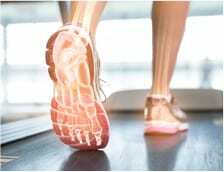 Plantar fasciitis is a condition defined by inflammation of the plantar fascia – a thick tissue that connects between the heel bone, across the bottom of the feet and to the toes. Healthy plantar fascia tissues absorb shock in the arch of the foot. But tension on the tissues can cause tearing, leading to inflammation. This inflammation usually causes throbbing pain in or near the heel. that athletes are particularly susceptible to developing plantar fasciitis? Though the condition can affect anyone, it is especially common in runners and people who participate in sports that require running or jumping. Additional risk factors for plantar fasciitis include being overweight or wearing shoes with inadequate foot support. People with plantar fasciitis often complain of heel pain – especially pain that is worse in the morning after waking or after sitting or standing for long periods of time. If you have a recurring stabbing pain in or near your heel, contact our office to schedule a consultation. Your surgeon can diagnose plantar fasciitis with a simple exam and imaging tests. What types of treatments are available for plantar fasciitis? Your surgeon may recommend one or more of many different treatments for plantar fasciitis, depending on its severity. Often, treatment is conservative and may include stretching, physical therapy, and the use of foot orthotics. In most cases, pain is manageable using an over-the-counter anti-inflammatory, though your doctor may recommend steroid injections for the relief of severe pain. Will I need surgery for my plantar fasciitis? Few people need to undergo surgery to treat plantar fasciitis. However, it is an option for patients with severe heel pain that has not responded to more conservative treatment measures, please ask your surgeon for more information regarding this.